Ladies quickly slip into your traditional Bavarian dirndls and men step into your leather lederhosen for a spirited Oktoberfest celebration with lively music, every Fri. and Sat. at Wirsthaus until October 8, 2011. Finally, an authentic German restaurant with a beer garden, has opened in Los Angeles, serving hearty classic, comfort food in a friendly and lively atmosphere. The owner Bjoern Risse and his girlfriend Christy, the general manager run this place beautifully. We admired the Spaten décor with hanging flags, as we peeked inside the new restaurant on La Brea. With only one table for two empty near the bar, we sat down and perused the menu. All around us patrons were drinking huge liter steins of beer. We learned that last week the restaurant invited a member from the German Counsel, Michael Ott, to come by to tap the restaurant’s first ceremonial Oktoberfest keg of traditional Munich Hofbrau beer. They offer almost twenty different beers on draft and at least 15 bottles of German beers. We opted to sample five different draft beers in 5 oz. glasses. It arrived on a wooden tray with the lightest colored beer, a Reissdorf Kolsch, next to it a Bitburger Premium and the last glass was a dark Weltenburger Dopplebock. 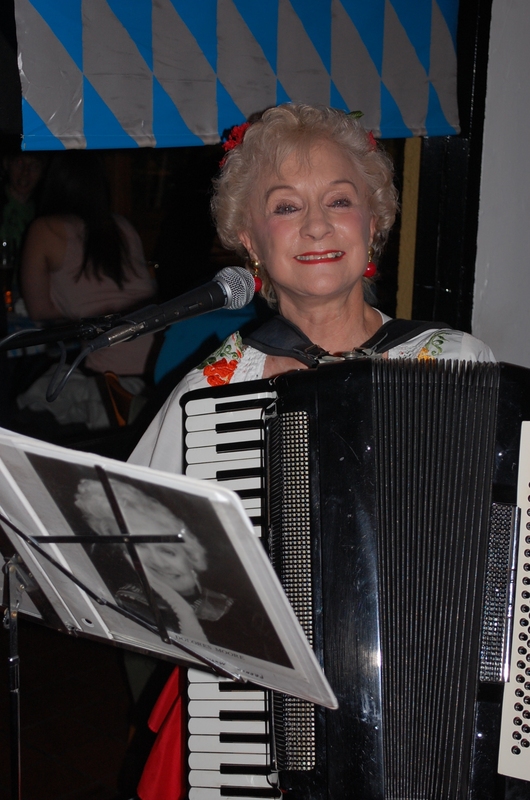 While deciding which of the eight appetizers to order, an adorable, Dolores Moore, walked inside with her red and white dirndl holding an accordion. She was the entertainment for the evening playing German songs enthusiastically. Throughout the evening she called out “Zicke, zacke, zicke, zacke, hoi, hoi, hoi!” It’s a famous German drinking song saluting to good health. We decided to order the Reibekuchon, six bite-size potato pancakes with mascarpone cheese and dollops of applesauce with a little sprig of dill. 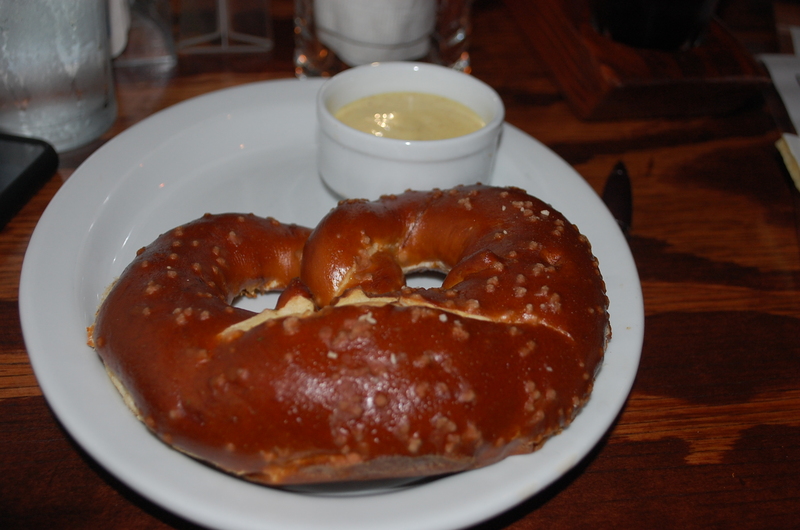 We also, ordered the Bretzel, a Bavarian pretzel with sweet yellow mustard. The mustard was heavenly. They serve it with their sausages too. The menu lists 8 Hauptspeisens/Entrees. We ordered the Jaeger Schnitzel with sautéed breaded pork in a creamy wild mushroom sauce and a Geflugel Wurst, two large chicken sausages. Both are served with two side dishes. The choices include fried potatoes with or without bacon, mashed potatoes, fries with or without onions, potato salad, red cabbage, sauerkraut, cucumber salad or green salad. We tried the tangy red cabbage and potato salad. The plates arrived filled with food. Not the healthiest meal in town, yet tasty, especially with a stein of beer. Before leaving, we opted for a slice of homemade apple strudel. It was served warm with freshly cooked apples and a small side dish of cream. Be sure to experience Wirsthaus during their Oktoberfest while the waitresses are still dressed in Bavarian clothing and the bartenders wear lederhosen and Bavarian Alpine hats. Thursday nights at 8 p.m. they host “Around the World” ping-pong tournaments. Look for the paddles and ping-pong balls hanging up by the bar. Grab a stein of German beer and enjoy the friendly vibe. Wirsthaus is open for lunch and dinner from 11 a.m. to 12:00 a.m. $ 345 N. La Brea Ave. (323)931-9291.